A bulk food recycling charity is expanding as it fights to reduce and reuse Auckland’s edible waste. Mayor Phil Goff officially opened KiwiHarvest’s new recycled headquarters in Ellerslie on February 22. KiwiHarvest collects food from commercial food providers that would otherwise be thrown out and delivers it to charities, refuges and food banks across Auckland where it is turned into meals. KiwiHarvest’s Julie Crocker and Lynette Van Nes from Encounter Hope loading vegetables into the charity’s van. The charity began in a donated office, before moving to a temporary warehouse in Goodman Business Park in Ellerslie. It’s now relocated to its new permanent space in the car park of the business park. The base includes an office made of four 20 foot containers, a warehouse made of three 40 foot containers and a fridge made out of a single 20 foot container. KiwiHarvest’s new fridge will enable meat and produce to be stored for longer than before. Manager Maria Madill said capacity had been the charity’s biggest issue. Since 2015 KiwiHarvest collected 262 tonnes of food around Auckland, 70 per cent of which was fresh produce. With the new facilities the charity could plan ahead and make food go further. 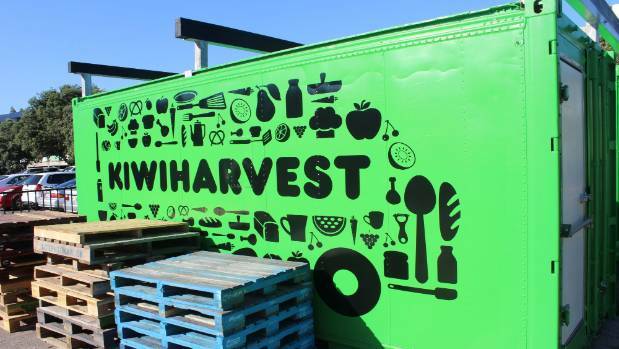 KiwiHarvest aimed to collect more than 360 tonnes of food this year. The food it collects varied widely from passionfruit ice cream with not enough swirl to leftover steaks from butcher events. When KiwiHarvest was given a specialty food like ricotta or aubergine they sent it to a destination with a chef. Madill said there would be more containers coming – one for a professional kitchen and one for a permanent freezer. The United Nation’s Food and Agriculture Organisation estimated 1.3 billion tonnes of food is wasted every year. In November 2015 a rubbish bin audit found New Zealand households were wasting $872 million of food every year.